Mitra Mobil is car rental company in Jakarta which providing car rental solution for personal and corporate. We provide many type of car base on customer need. We always keep our operational car to be clean and well maintained; supported by our experienced driver to bring good services and to give transportation solution for our customer. We also routinely check and service our operational car, this is to minimize the risk of vehicles problem during the rent period. Mitra Mobil Car Rent present to provide good quality service with very competitive price in Jakarta area. We always provide good service with reliable car to our customers. Mitra Mobil Car Rent provide well maintained car, clean, secure, comfortable, with cheap, reasonable, competitive rates. Our customer service officer are very friendly and always ready to assist our customers at 24 hours 7. Our priority is to bring customer safety, secure and comfort by using our car rent services in Jakarta, Bogor, Depok, Tangerang and Bekasi. We provide many type of cars to be rented, both with manual transmission or automatic transmission. For small group (1-5 person max) we can provide comfort city car such as Toyota New Camry or Toyota Yaris. 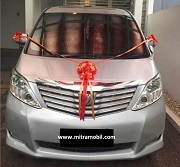 And for medium group (4-8 person max) we can provide family car such as Toyota Alphard, Toyota Calya, Toyota Grand New Avanza, Toyota New Avanza, Toyota Innova, Grand New Innova, Innova Reborn, Nissan Grand Livina, Daihatsu GranMax, Daihatsu Xenia, Daihatsu Terios, Suzuki APV, Honda Mobilio. And for very large group (10-50 person) we can provide bus such as Isuzu Elf, Toyota Hiace or Big Passenger Bus. Booking your car by today to ensure the availability of your chosen car. To provide satisfying services for our customers. To became a reliable car rental partners. To provide transportation solutions for our customer. To provides good, clean, comfortable and secure car rent transportation.